This past week I planted my spring greens. There is something about placing seeds in the ground. As though you the planter begin to swell with the same new life of the seeds: a new beginning, a new season. New life. The ground yields up plants, which enable people to live. Not only to live, but to live pleasantly. Does Xenophon have in mind the crispness of a spinach leaf, the sweetness of peas, the tang of the vine-ripened tomato? 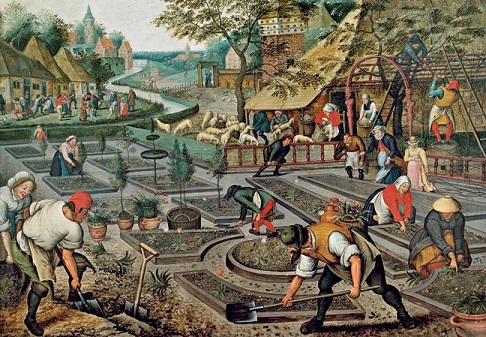 Or does he have in mind a late-winter sowing—in recently snow-enriched soil, or a rosy-skied summer morning weeding with your children at your side? Or maybe he has in mind what the prophet Isaiah speaks of: eating the fruit of vines you yourself have planted (Is 65:21). There is so much life—pleasant life—hidden in dark soil. It is there, waiting. Waiting to be received, by the hand that is open in cultivation. Would that more of us open our hands, together. Xenophon (430-354 B.C.) was a soldier, historian, and philosopher of Athens. Like Plato he wrote dialogues featuring Socrates as a great teacher. Among, these dialogues is Oeconomicus, translated as The Estate Manager, in which we get an insight into the structure and principles of the ancient household.